On Android, when a new message is received, a notification appears in the sliding panel showing the user the number and contents of the new message. While this is a handy way of displaying the message, it does not give you the immediacy of the iPhone’s pop-up notifications. Instead, you have to slide the panel down, click on the message, wait for the Messaging app to launch, and then type in your reply. There are a number of apps in the Android market that help to shorten this process by displaying the SMS as soon as it appears and allowing you to immediately respond to it. SMS Popup is one of them. 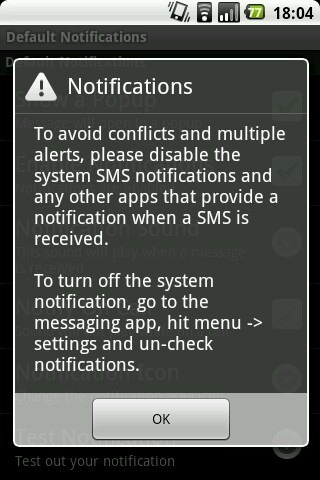 Firstly, in order to avoid conflicting notifications it is prudent to disable Android’s default notifications. 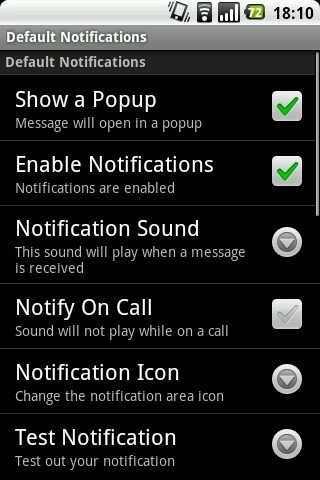 To do this launch the Messaging app, click Menu > Settings and uncheck “Notification”. This will disable all SMS notifications, so you must re-enable this if you would like the default Messaging app to handle all your notifications. After launching SMS Popup, ensure that the “Enable SMS Popup” box is checked. This will ensure that whenever you receive a new SMS, a pop-up notification (customised to your liking) will appear. 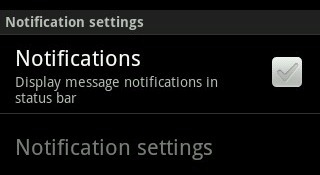 Next, you can head into “Notification Settings” to customise the look and feel of the SMS pop-up box. These can be done for each individual contact or for all incoming messages. There are a number of options you can change here including the notification sound, the notification icon, vibration settings, LED settings, and whether or not you want a reminder of the notification. 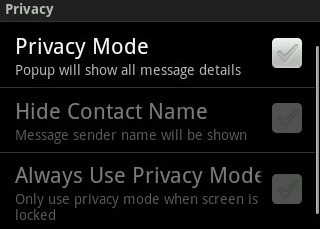 Button Configuration: This modifies the buttons that appear on the SMS pop-up box. You can choose to display a variety of buttons (max of 3) with different functions, including: close, delete (with or without confirmation), reply, quick reply, display inbox or text-to-speech (which has the phone read the message back to you). 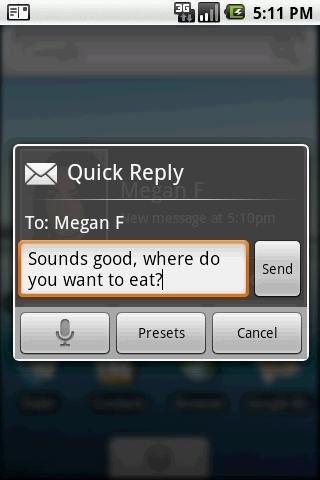 Quick Reply Options: This enables the quick reply function, allowing you to quickly enter preset messages immediately after you see a new message. Screen Control: This controls what happens to the screen when a new message is received. 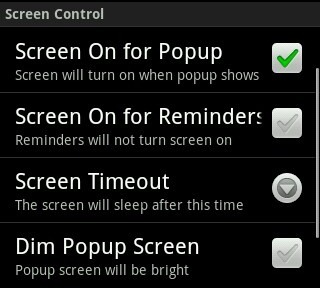 You can have the screen turn on for a new message or dim the pop-up screen (to save battery). Privacy Options: Here you can disable the pop-up from displaying certain information, to protect your privacy. 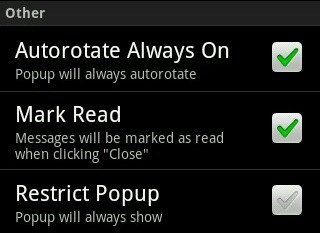 Other Miscellaneous Options: This section has the option to mark messages as “read” when you close the message. 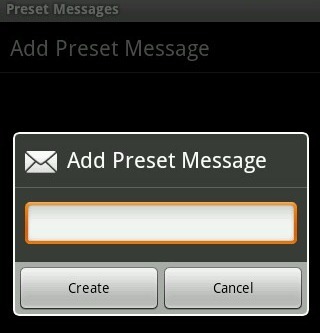 Finally, you can configure Preset Messages to appear in the quick reply list. 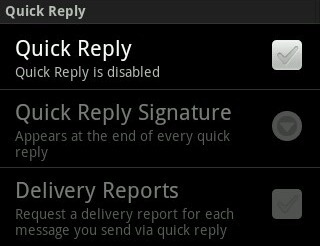 Here you have the option to “Close“, “Delete“, or “Reply” to the message. If you “Close” the message, it will also be marked as “read”. Deleting the message will permanently remove it from your phone and if you chose to reply to the message you will be presented with a number of other options. Firstly, you can simply input your message into the text box. Secondly, you can reply to the message by using your voice (click on the mic icon). Thirdly, you can use your predefined messaging presets which you configured earlier (see above). Finally, once you are satisfied with your message, select “Send“. These buttons are all configurable from the “Additional Settings” menu. The beauty of SMS Popup is that it can be used solely for notification purposes, while at the same time you can use your default messaging app to reply to new messages. Simply ensure that your standard text messaging app has notifications enabled and SMS Popup does not mark messages as read or delete them. This app is a great example of what makes the Android platform so versatile; it fills a very small gap created by a lack of functionality in the Android’s default Messaging app.